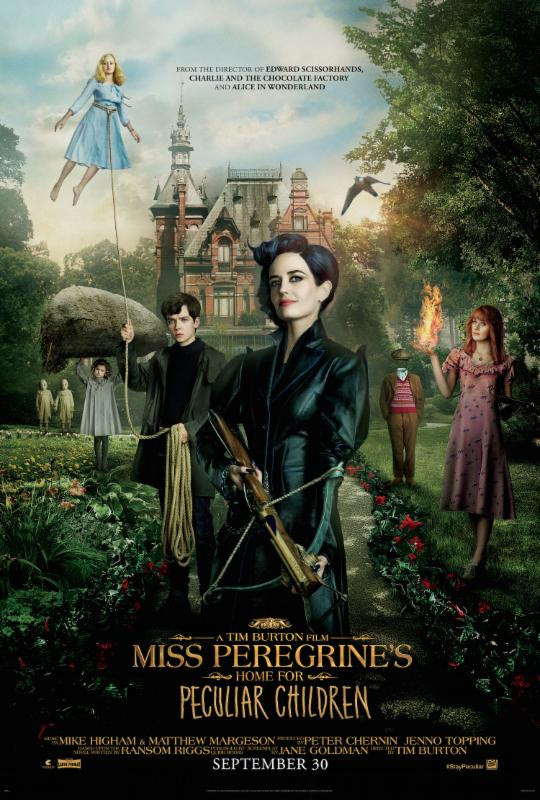 Tim Burton's new dark fantasy adventure, based on the 2011 young adult novel (of the same name) by Ransom Riggs. Burton directed the film, and Jane Goldman (a frequent writing collaborator of director Matthew Vaughn) wrote the screenplay. It tells the story of a boy that travels to a mysterious orphanage (on a Welsh island), after his grandfather is horrifically killed, that's filled with peculiar (but very gifted) children. The film stars Eva Green, Asa Butterfield, Ella Purnell, Samuel L. Jackson, Chris O'Dowd, Terence Stamp, Judi Dench and Allison Janney. It's received mixed reviews from critics, and it underperformed at the Box Office (due to it's $110 million budget). I enjoyed it, but it definitely doesn't live up to Tim Burton's best (in the slightest). Jake's grandfather, Abraham (Stamp), has been telling Jacob (Butterfield) stories about a magical place, filled with kids with special powers, since he was a very young boy. He also told him about vicious monsters with tentacles, that Abraham had to fight (as a child), and a beautiful headmistress, named Miss Peregrine (Green), that watched over the gifted children. Miss Peregrine is a Ymbryne, according to Abraham (in his stories), which can change into a bird and control time. The children's powers ranged from turning invisible, to controlling air. After Abraham is mysteriously (and very violently) killed, Jake (who's now 16-years-old) travels to the mysterious place, on an island off the coast of Wales, with his father Franklin (O'Dowd). Once there, Jacob learns that the stories are all true! The movie (like all of Tim Burton's work) is visually stunning, and quite beautiful to watch. There might be a little too much CGI, for some people's tastes, but I still enjoyed it. The film is very dark, violent (especially for a kids' movie) and weird (like all of Tim Burton's films); and that's why I liked it as well. It's also got plenty of action, and fascinating characters. While the performances are all good (especially the always amazing Eva Green), the characters are slightly underdeveloped though; and the drama is a bit forced (and lacking any true emotion). The story is also a little too complicated, and somewhat hard to follow. It's far from a perfect movie, but it is entertaining; it's definitely better than Burton's last couple films.